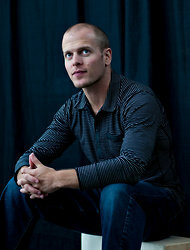 Timothy Ferriss is the author of “The 4-Hour Chef,” published by Amazon. Amazon prides itself on unraveling the established order. This fall, signs of Amazon-inspired disruption are everywhere. There is the slow-motion crackup of electronics showroom Best Buy. There is Amazon’s rumored entry into the wine business, which is already agitating competitors. And there is the merger of Random House and Penguin, an effort to create a mega-publisher sufficiently hefty to negotiate with the retailer on equal terms. Amazon inspires anxiety just about everywhere, but its publishing arm is getting pushback from all sorts of booksellers, who are scorning the imprint’s most prominent title, Timothy Ferriss’s “The 4-Hour Chef.” That book is coming out just before Thanksgiving into a fragmented book-selling landscape that Amazon has done much to create but that eludes its control. Mr. Ferriss’s first book, “The 4-Hour Workweek,” sold nearly a half-million copies in its original print edition, according to Nielsen BookScan. A follow-up devoted to the body did nearly as well. Those books about finding success without trying too hard were a particular hit with young men, who identified with their quasi-scientific entrepreneurial spirit. Signing Mr. Ferriss was seen as a smart choice by Amazon, which wanted books that would make a splash in both the digital and physical worlds. When the seven-figure deal was announced in August 2011, Mr. Ferriss, a former nutritional supplements marketer, said this was “a chance to really show what the future of books looks like.” Now that publication is at hand, that future looks messy and angry.